We still had a handful of leftover chicken to use up… we throw NOTHING away food-wise! Today I decided to send it out in style, by transforming it into a chicken and leek pie… so simple, but so delicious. First up, I heated a little oil and butter in a pan and tossed in two cloves of finely chopped garlic. I added a couple of sliced leeks and a good glug of white wine. After the wine had cooked off, I added a good glug of cream and the leftover chicken. We also had a handful of leftover onions and roasted purple sprouting broccoli from the weekend, so that all went in too. Once warm, I spooned the mixture into a pyrex dish, rolled out some puff pastry and made a lid. This I brushed with beaten egg so it will go lovely and brown. I then cooked for about 35 minutes at 180 – just until the lid had puffed up and was brown. The weather was blooming gorgeous this weekend, so as the garden is looking so good at the moment, we had an impromptu barbeque. The tripod barbeque came out of hiding and we proudly set it up on the decking, along with chairs for our guests and outside table laden with condiments, cutlery and the family favourite: spinach and water chestnut dip. The menu was simple: a couple of chickens started off in the oven and finished on the barbeque, sausages and onions cooked in a pan outside. In addition, we served roasted purple sprouting broccoli in garlic and a huge salad. The food went down a storm, our guests had a great time, and we congratulated ourselves on turning a party around with a moment’s notice. After everyone had gone, we had leftovers. A large tub of salad and another of chicken. The chicken went into a couple of sandwiches for lunch, but last night we wanted to use it up… and this is where the good bit happened! The majority of chicken was heated up in a pan with some garam masala and a good spoon of sesame seeds (there’s still a handful of chicken left, but we’ll come to that in a later post). The baby gem lettuce leaves were griddled in the griddle pan so they were slightly wilted but with scorch lines across them. Next, the leftover sliced radish, cucumber and cherry tomatoes were tossed around a pan with some chopped garlic so they were warm but still had a crunch. The whole lot was tossed into a bowl and we tucked in. A sprinkle of coriander leaves and the dish was complete. The verdict? Absolutely blinking delicious – warm salad is so tasty! 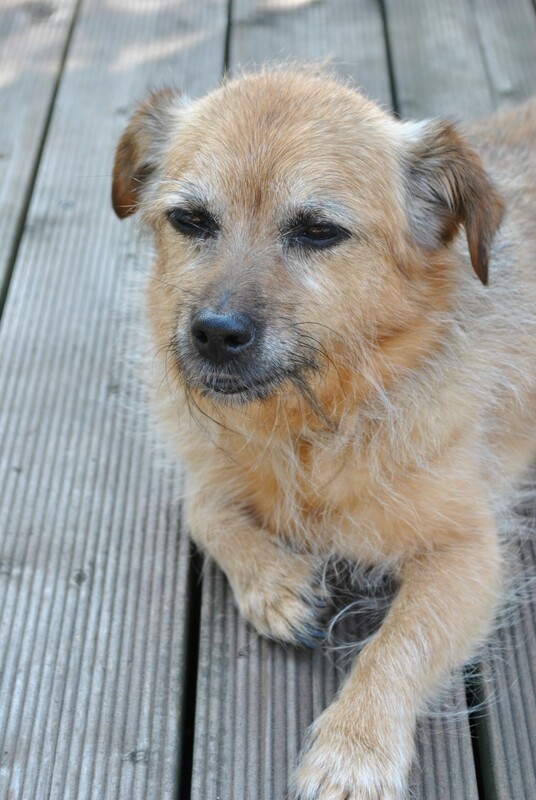 We re-homed Winnie a good few years ago and as such can only guess at her real age. We do know for sure that she was a bit hit and miss with the old egg laying, and popped out her last one over a year ago. But she was lively and healthy enough, and enjoyed pottering and pecking around the garden with the younger girls. A couple of days ago I noticed she was looking a tad peaky. Normally she’d be clucking around with the rest of the flock, but she was off her legs and keeping her distance from them. Checking on her the next day, I was dismayed to see that she’d clambered out of the hen house and appeared to have spent the night laying in the damp dirt of the coop floor. Crawling in on my hands and knees, I gently scooped her bedraggled form off the ground, and took her up to the house to dry out. Into a box went some straw, and on top of that lay our sick chicken. Looking decidedly sorry for herself, every now and then she’d stretch her neck and appeared to be gasping for air. A root round on the t’interweb suggested that she probably had something called gapeworms. Gapeworms can be picked up in larvae found in earthworms, snails and slugs, andresult in red worms that live in the throat of the chicken, making it difficult for her to eat or breathe. Swiftly gearing into action, I shot up to our local farm store in the hunt for some worm treatment, which incidentally could have funded a couple more chickens. This was duly diluted and fed to Winnieand we could do no more than hope for the best. Sadly, our best efforts weren’t enough to save her… the next morning I peeped in on her to find that she’d carked it during the night. Wrapping her final resting box in black bags, I gave her a dignified send off in the black bin. 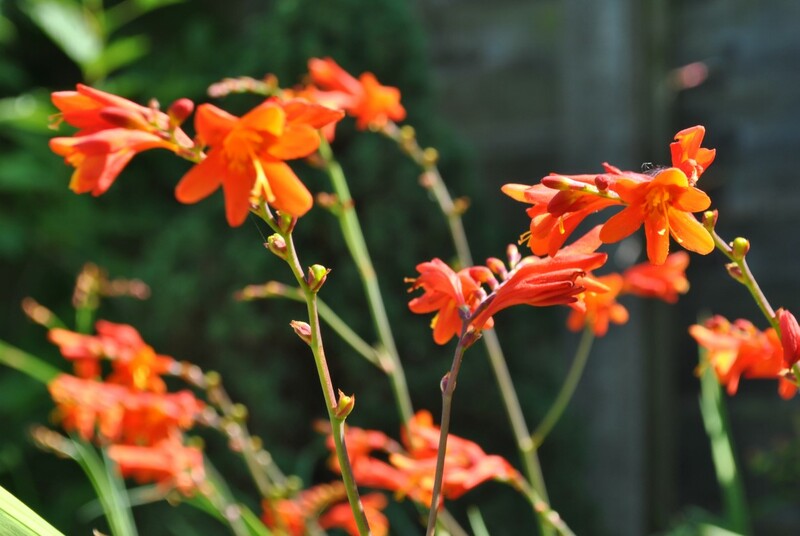 A garden burial wasn’t an option: we have a terrier who’d be digging her back up in no time at alland I didn’t fancy a tearful reunion next summer. 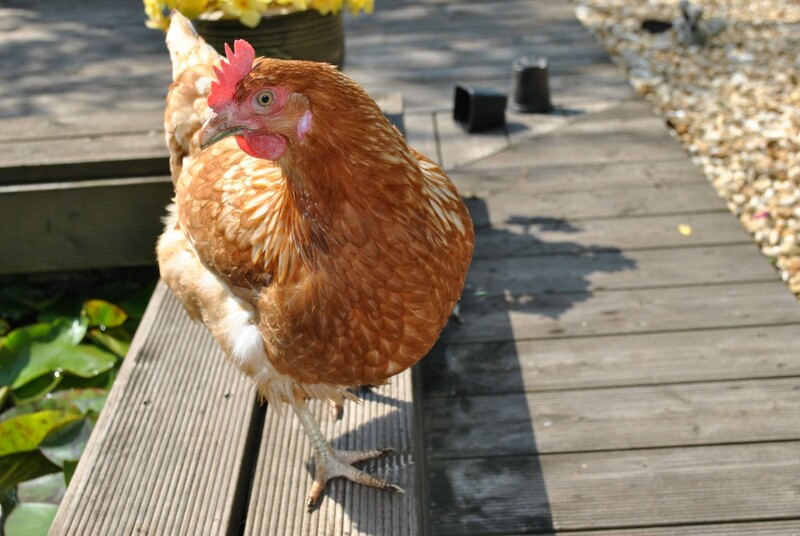 So we say a final ‘goodbye’ to Winnie: our oldest girl with the sporadic egg production. Gone but not forgotten, to the great chicken coop in the sky. 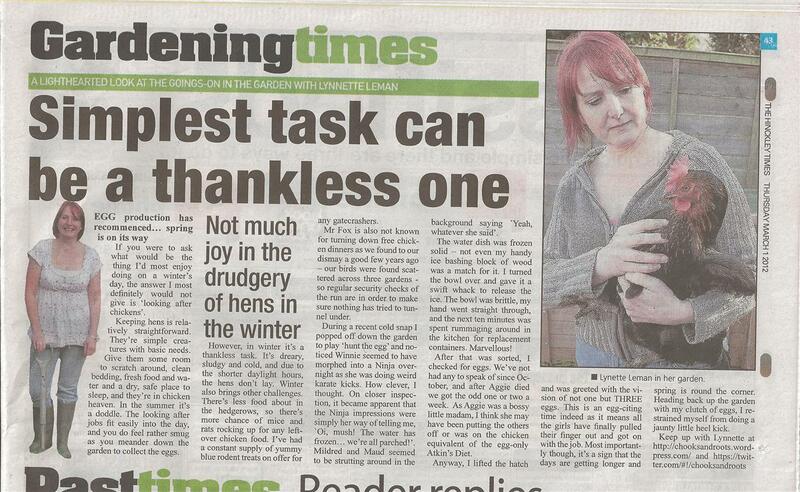 Appeared in The Hinckley Times on 24 October 2013. 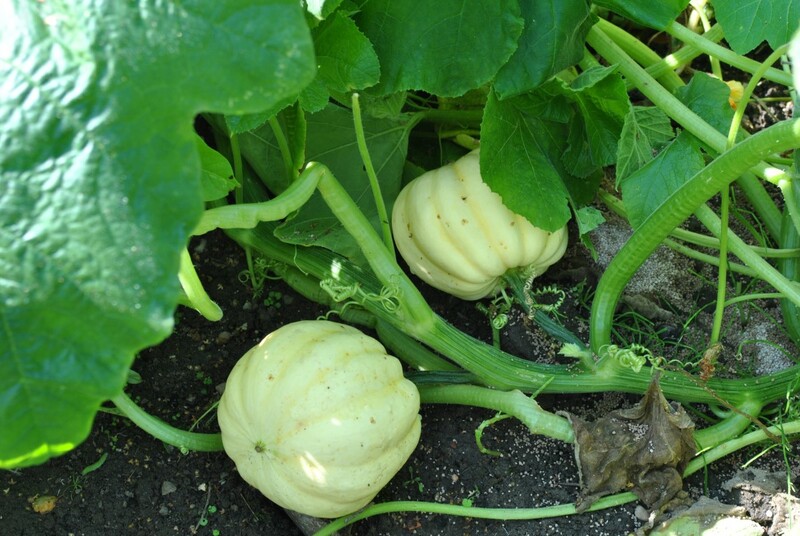 I’m not sure how big these need to be – or will get – before we pick them. They don’t look ‘done’ yet though. 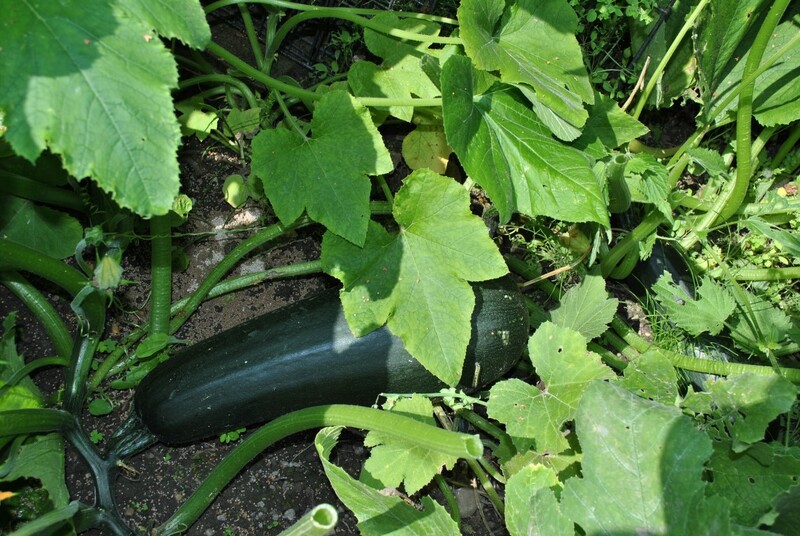 I’m growing this as big as I can, and will be making it into marrow brandy. If you are of a sentimental disposition, I suggest you look away now, for I am afraid the news is not good. A couple of days ago I nipped down to check on the girls, and discovered Mildred, our Cuckoo Maran sparked out in the hen house. On further inspection it transpired that she wasn’t just having a sneaky kip… The prognosis was worse than that… She’d carked it. I had noticed she had a bit of blood on her comb the day before, but as she had seemed quite perky in herself, had assumed one of the others had simply got a bit over-enthusiastic near the feeding bucket. Obviously it was a tad more serious than that. We adopted Mildred and Maud from the RSPCA a good while back. I’d dubbed them ‘the evil twins’ as they were inseparable and always appeared to be hatching cunning plots and plans from the back of the coop. They were a good deal more skitty than Winnie, our other bird, and if you tried to get near them or pick them up, they screamed blue murder. So, we duly removed Mildred’s stiff little body, wrapped it tenderly in black bags, and she is currently in the chicken morgue otherwise known as ‘the black bin’. The other two didn’t even seem to miss her: Maud simply dashed into the nesting box to squeeze a quick egg out. It was as though she just couldn’t concentrate on the job in hand with her prone twin stretched out before her. In other news, our omelette intake is down. Mildred is on the left. so called because when we first had her, she came with a red tag around her ankle. Mild-Red… see what we did there? After weeks of moaning about the incessant rain, this week brought something new for us all to grumble about. In the space of just a couple of days, the temperature dropped, the heavens opened and we must have had, ooh, about two inches of the white stuff. Us Brits LOVE the drama of a good weather story, so instantly TV presenters were gushing on about ‘The Beast from the East’ and spreading doom and gloom about the impending cold snap. Facebook suddenly turned into a weather channel, with all and sundry posting snowy scenes, just for the benefit of those of us who may not have windows of our own. We had a running update on how skiddy the paths were and success stories of people braving the school run… and getting back alive. Others were sagely advising us to take care and not to go out unless it was completely necessary: “It’s like an ICE RINK out there!” For goodness’ sake, Twitter even developed a hashtag-snow! 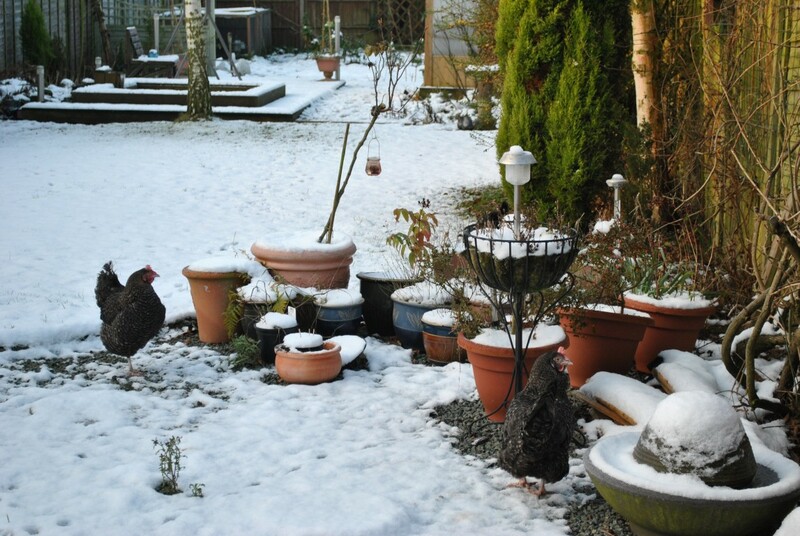 Even the chickens weren’t that keen on the stuff – and they’re supposed to be hardy farm animals. I love to see the girls free ranging in the garden, but can’t let them out during the summer, because basically they’d poo everywhere and either dig up or eat all my meagre attempts at self-sufficiency. So in the winter months I like to let them out to have a grub around; with any luck they’ll sniff out and eat any slug or snail eggs in the process. Yesterday, I popped off down the garden and opened the coop door with a flourish. Taking a tentative look outside, they didn’t know what to make of the snow. Eventually they ventured out, and cautiously came out onto the lawn. A little later in the afternoon, I glanced out of the window and they were nowhere to be seen. All three of the girls had disappeared into thin air. 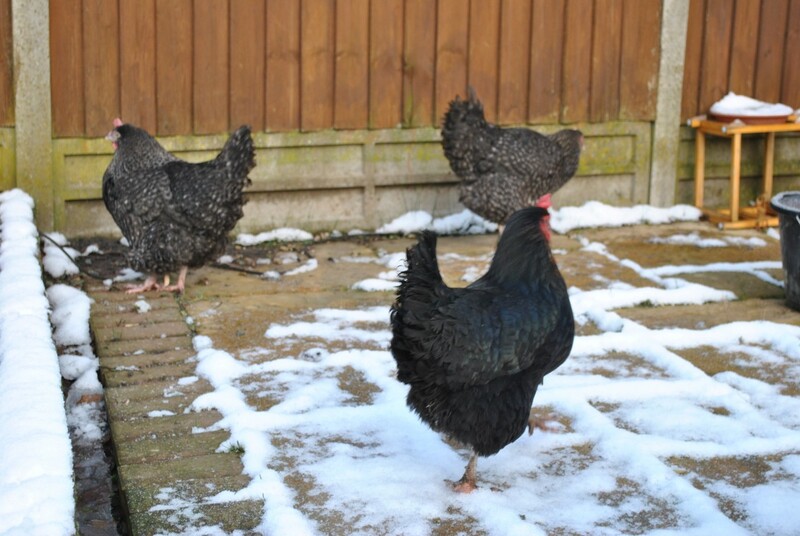 Donning my wellies, I trudged off down the path to make sure they were all OK, and found them looking decidedly miserable, perching in the coop. At three in the afternoon, they’d had enough of the weather, and had taken themselves off to bed for an early night. The first job of this morning was to make sure they had access to water and not ice, so I whizzed down with a clean, full water container. At the sight of me, Winnie, Maud and Mildred got slightly excited at the prospect of a fresh drink and freedom. Sliding back the bolt, I tugged on the handle of the coop door. Slight problem afoot – the door was frozen shut. Luckily the little door to the nest boxes wasn’t, so I left this open for them to hop out, and left the water container just outside. Sure enough, half an hour passed and they had figured out their alternative exit, and all three of them came trotting up the garden, noticeably happier than yesterday. It wasn’t quite ‘Dancing on Ice’ but they certainly weren’t eyeing it with the suspicion of yesterday. They made a beeline for a sunny spot on the patio, and there they have been ever since, basking and preening. When it starts to get dark I’ll pop down to the coop to make sure they all made it back safely. You know the feeling. You’ve had a wonderful couple of weeks on holiday, and are well and truly relaxed and recharged. You saunter out into the garden to squeeze in a bit more relaxation time before the dreaded return to work, and it hits you. 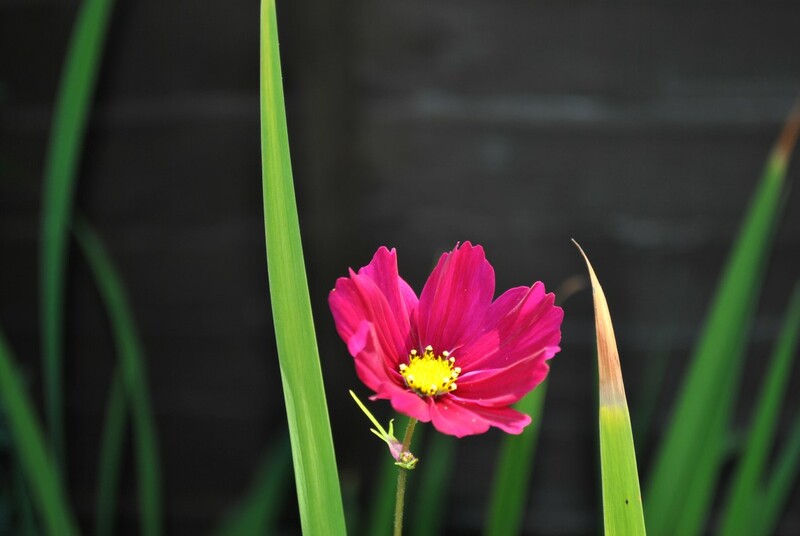 The garden is a tip: the lawn is up to your knees and the plants have trebled in size. However, there are a couple of things you can do before you set off, to ease the devastation on your return. 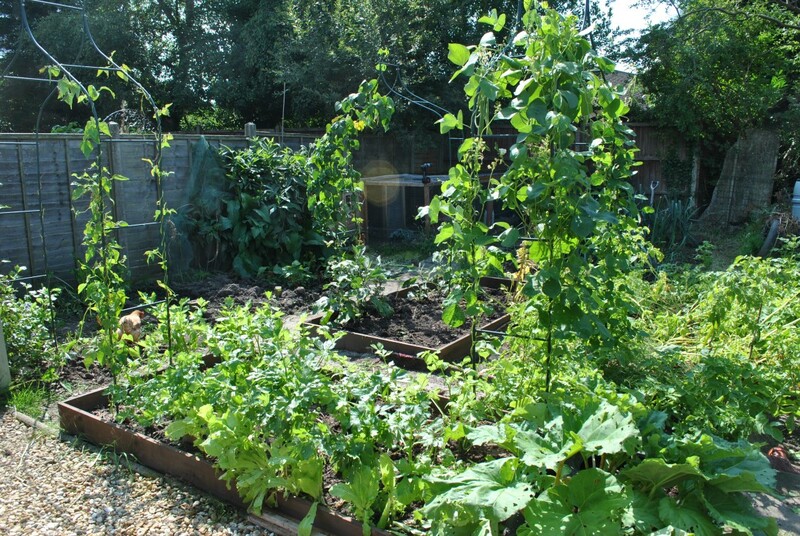 Weeding – hoe in amongst the vegetables and have a general weed around the garden. If they’re out, they’re less likely to take over the garden while you’re away. 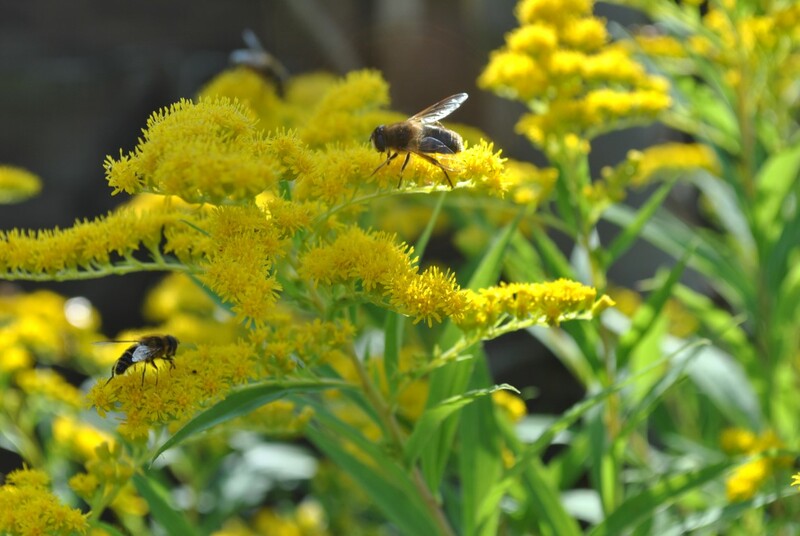 Deadhead – take off the flowers that have finished. This may well encourage the plant to throw up some new flowers, just in time for when you get back. Mowing – cut the lawn as short as you can without scalping it, and with any luck it will just need a quick whiz over after your holiday. 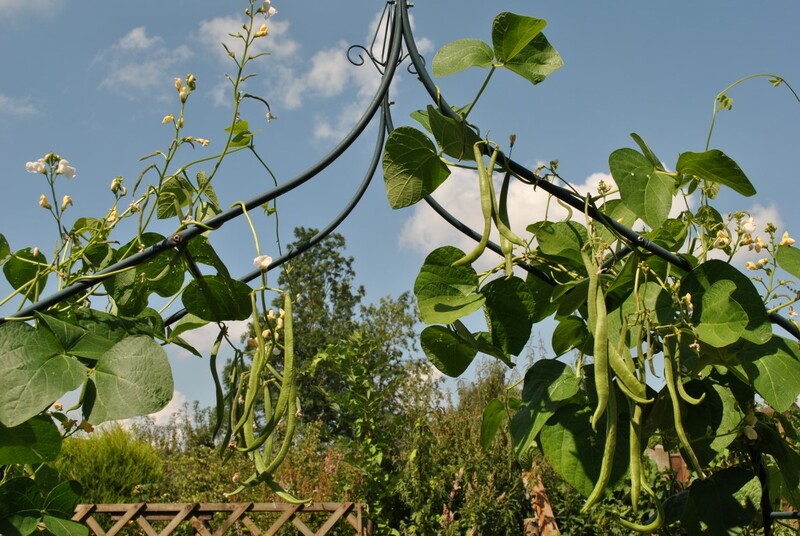 If you are growing vegetables, it’s always handy to ask/enlist/bribe a friendly relative or neighbour to pop in to look after the plants. I normally tell them to help themselves to any crops that are ready whilst we’re gone: they get a free dinner and we don’t have to throw stuff away when we get back. A holiday gift normally goes down a treat, too. Once you have found a willing volunteer, make it easy for them. Nobody minds popping in on ‘Operation Plant Watch’ for five minutes a day, but if it’s a faff of a job that lasts ages, they may think twice about volunteering in the future. We’ve installed a watering system in the greenhouse. 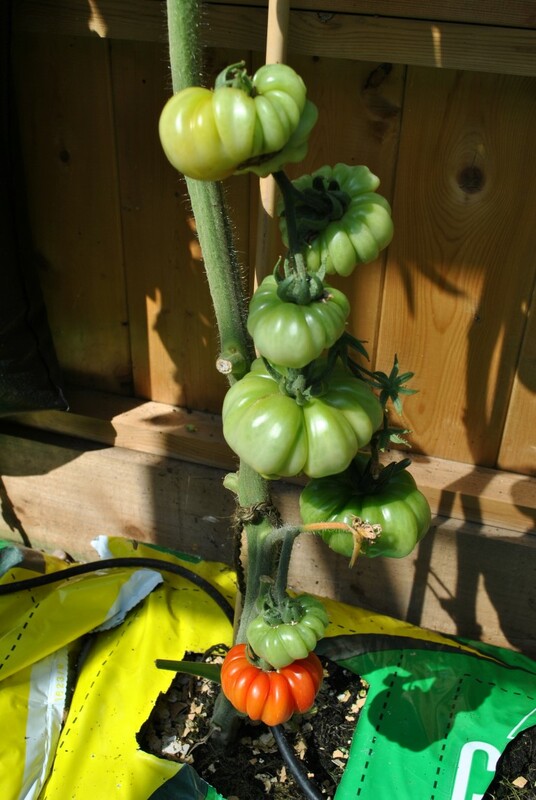 You fill up one bag on the greenhouse wall, and hey presto – six plants are kept as happy as Larry for a couple of days. I’ve also put the pots on the bench inside troughs and trays – just to keep the water lasting that little bit longer. All the pots, inside and out are grouped together so they can all be watered in one go. The water butts have all been topped up too. 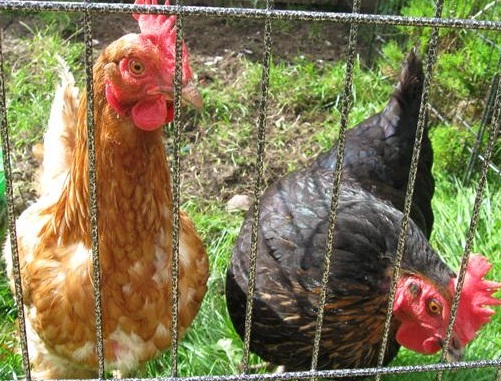 If you keep chickens, you’ll know that they are unfussy creatures with relatively simple needs. As you will be away from the house, have a quick check around the coop to make sure that they can’t get out, and more importantly, no predators are likely to get in. Give the hen house a really good clean, with fresh sawdust and straw, and if the forecast is hot, a quick squib of anti-red mite powder won’t go amiss either. Also, ensure that part of the coop is in shade, so they always have somewhere cool to retreat to. Make sure the food and water is full to the brim, and you may also want to think about an extra water supply too – just to be certain they won’t go thirsty. 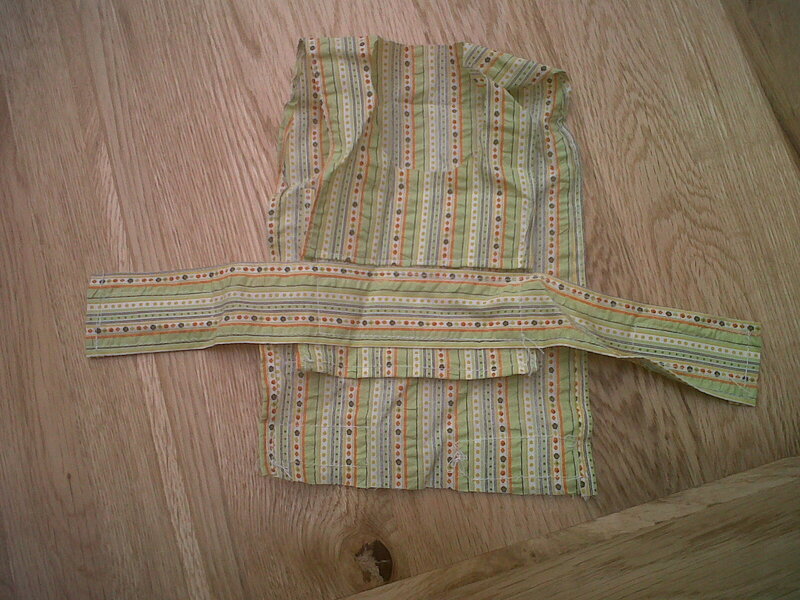 Anything sturdy that won’t be kicked over will work well, eg an old washing up bowl on top of a breeze block. 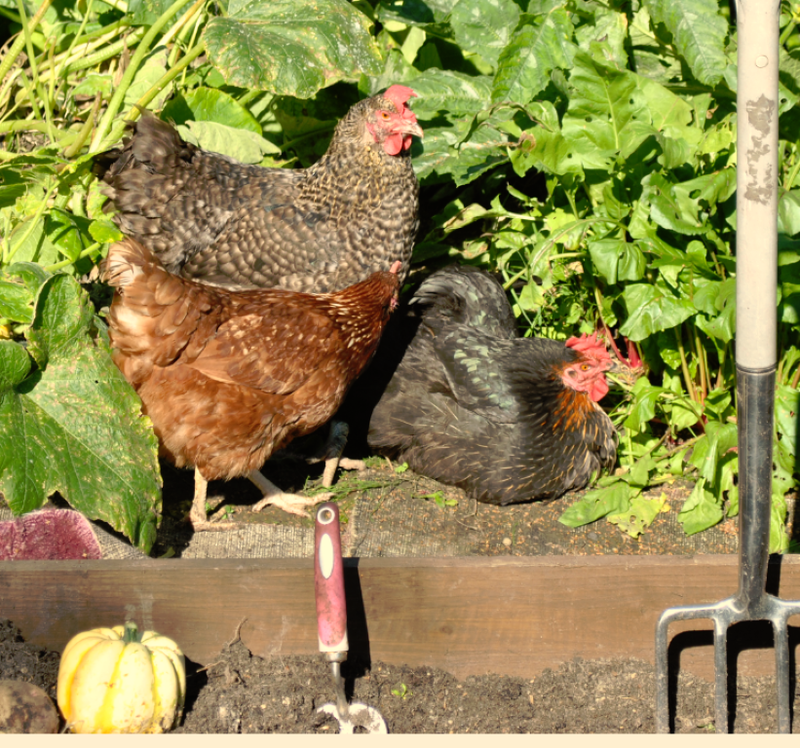 Ask your garden sitters to check the hens regularly to make sure they are happy and have plenty of fresh food and water, and to collect any eggs. After all that, you can be reasonably safe in the knowledge that all should be tickety boo when you get back, and enjoy your holiday. Bon voyage! If you were to ask what would be the thing I’d most enjoy doing on a winter’s day’, the answer I most definitely would not give is ‘looking after chickens’. Keeping hens is relatively straightforward. They’re simple creatures with basic needs. Give them some room to scratch around, clean bedding fresh food and water and a dry, safe place to sleep, and they’re in chicken heaven. In the summer it’s a doddle. The looking-after jobs fit easily into the day, and you do feel rather smug as you meander down the garden to collect the eggs. However, in winter it’s a thankless task. It’s dreary, sludgy and cold, and due to the shorter daylight hours, the hens don’t lay. Winter also brings other challenges. There’s less food about in the hedgerows, so there’s more chance of mice and rats rocking up for any leftover chicken food. I’ve had a constant supply of yummy blue rodent treats on offer for any gatecrashers. Mr Fox is also not known for turning down free chicken dinners, as we found to our dismay a good few years ago – our birds were found scattered across three gardens – so regular security checks of the run are in order to make sure nothing has tried to tunnel under. During a recent cold snap I popped off down the garden to play ‘hunt the egg’ and noticed Winnie seemed to have morphed into a Ninja overnight as she was doing weird karate kicks. “How clever, I thought”. On closer inspection, it became apparent that the Ninja impressions were simply her way of telling me, “Oi, Mush! The water has frozen… we’re all parched!”. Mildred and Maud seemed to be strutting around in the background saying “Yeah, whatever she said”. The water dish was frozen solid – not even my handy ice bashing block of wood was a match for it. I turned the bowl over and gave it a swift whack to release the ice. The bowl was brittle, my hand went straight through, and the next ten minutes was spent rummaging around in the kitchen for replacement containers. Marvellous! After that was sorted, I checked for eggs. We’ve not had any to speak of since October, and after Aggie died we got the odd one or two a week. As Aggie was a bossy little madam, I think she may have been putting the others off, or was on the chicken equivalent of the egg-only Atkin’s Diet. Anyway, I lifted the hatch and was greeted with the vision of not one, but THREE eggs. This is an egg-citing time indeed, as it means all the girls have finally pulled their finger out and got on with the job in hand. Most importantly though, it’s a sign that the days are getting longer, and spring is most definitely around the corner. Heading back up the garden with my clutch of eggs, I restrained myself from doing a jaunty little heel kick. Yesterday was a sad day. As I went to shut the girls in, I noticed a still, lifeless body in the run. Aggie, our feisty little brown chicken was no more. At first I thought a fox had got into the garden, but on closer inspection it simply seemed to be a case of old age. We adopted Aggie and Winnie a couple of years ago, and on reflection they have produced the most expensive eggs in the history of the universe. 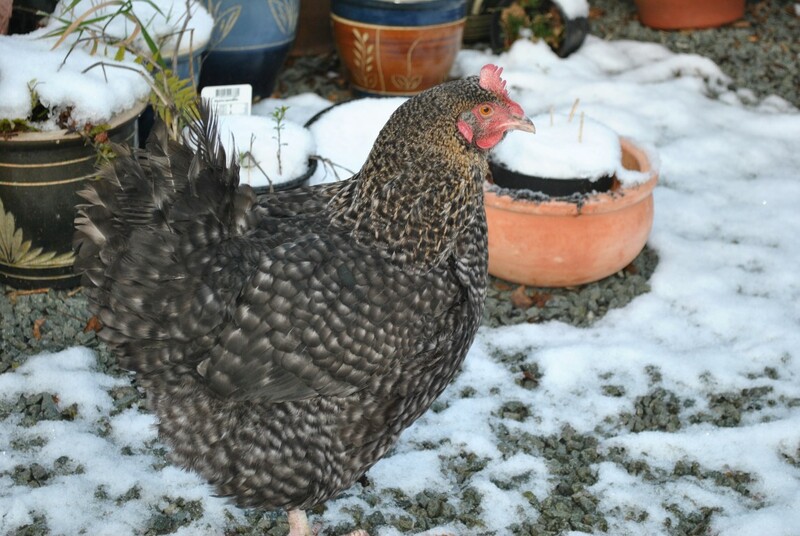 I don’t recall Aggie actually laying any eggs, and Winnie’s production line is sporadic, to say the very least. First there was the expense of getting them a coop. It soon became apparent that although this was marketed for 4 birds, if they were going to walk around at any point this wouldn’t be nearly big enough (ever seen chickens doing a do-si-do? ), so I bought a massive dog crate to use as an extension. Then we decided that we wanted something a bit more permanent, so off the OH went to the wood yard to spend just a bit more money on the girls, and he built them a des res run . Oh, and then we had to get a couple more girls in, as by this point, we were still only on about one egg a week. 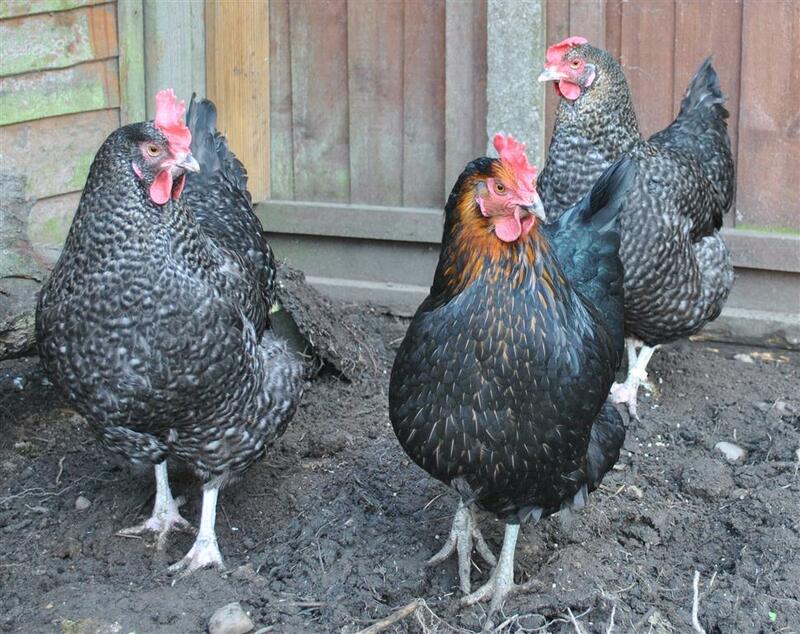 However, all that changed when we introduced Mildred and Maud, the two Marans from the RSPCA. All the helpful folks on the ‘tinterweb said to introduce new girls at night when they were all dopey. I diligently followed this advice, and stole down at dusk to pop the new ones into the roost. You would have thought I’d put a fox in there. The chicken house was banging about, and it soon became apparent that Aggie and Winnie did not want lodgers. This resulted in me having to separate the girls completely during the day for a few months. It was a long process, but worth it in the end as finally they all got on together, and peace was restored. Well, peace was restored, but the pecking order changed somewhat. They say that the bullied will get their come-uppance… Aggie glided through the ranks with the stealth of a gazelle, and instantly became top chicken. She filled out, her feathers grew back thick and plush, and she even walked with a cocky little gait. Mildred and Maud (and Winnie, to some extent) were kept firmly in line. Time went on. Aggie strutted (but didn’t lay), Mildred and Maud scarpered (and laid like troopers), and Winnie just kept out of the way. Aggie went a bit ‘crouchy in the summer, and we thought we were going to lose her, but after plopping out her last and final egg (with no shell on), she perked up no end. Until yesterday. I gently removed her still little body, wrapped it up in bags, and gave her a dignified burial in the black bin. To my knowledge you can’t put dead chickens in with the recycling. A garden burial was out of the question, as we have a terrier who likes to dig things up, and I couldn’t face the thought of a tearful reuinion with Aggie three months from now. So, my final words on this subject are, “rest in peace, Aggie – you were a good egg”. 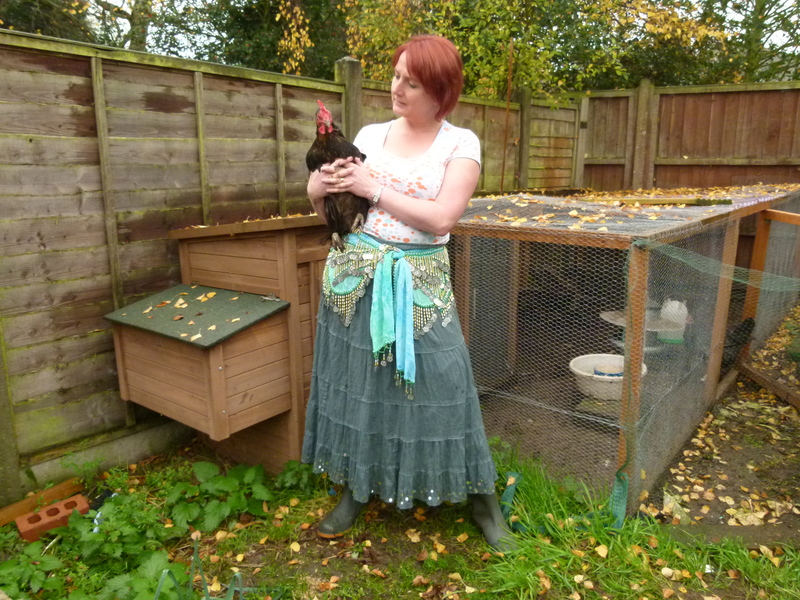 When you find yourself standing in the garden, in full belly dancing gear (plus wellies), holding Winnie the chicken, you know you have either been a good egg to someone, or you’ve been well and truly stitched up. Said friend is doing a photography course, and was on the lookout for anyone with ‘an unusual hobby’. Being the helpful sort that I am, I offered to ask my belly dancing class if they wouldn’t mind her lurking around one week; I thought all the jingly belts and swishy scarves might make for an interesting picture. She then informed me that it was actually ‘Portrait’ week, so what she really needed was a snapshot of just one person’s life, in their own environment. Realisation dawned that I’d just won the Willy Wonka golden ticket for a modelling session… looking like an extra in a bad Bollywood film. In desperation, I tried the old “I’m the most unphotogenic person in the world” chestnut (actually true), but she was having none of it. “Wouldn’t you rather have a picture of me mucking out the chickens?”, I tried again, thinking that if I’m going to be photograhed, it may as well be doing something I’m at home with. I breathed a sigh of relief, thinking I was indeed, off the hook… but she carried on, “I can have a picture of you – in your belly dancing gear – holding a chicken! It will make a fantastic portrait!”.